After a great day on April Fool's Day, I woke up the next morning wondering if the punch line will be delivered today...Hmm. Better make sure I have everything, I thought to myself as I rolled my futon bed and prepared myself for another day of adventures. Today, I will be heading to Osaka for a day before continuing on to Kyoto. 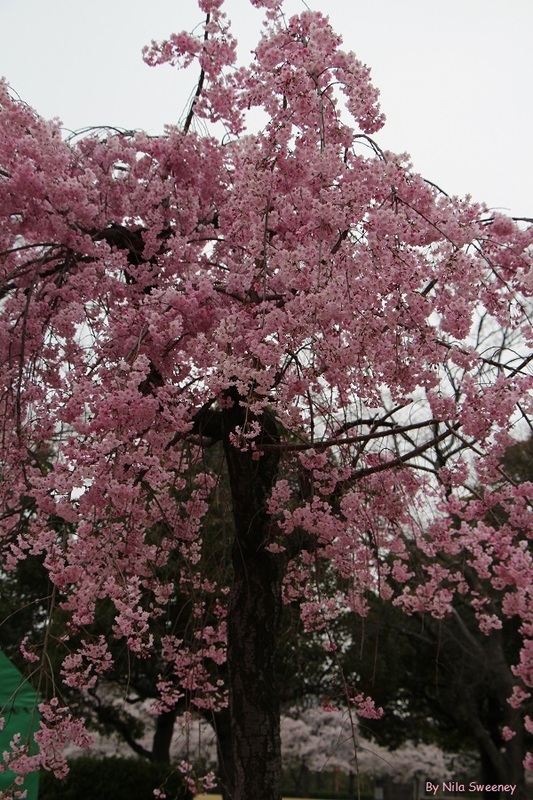 I haven't really made any specific plans except to visit a few temples and see lots of cherry blossoms. Ahh, I'd be right, I kept reassuring myself, as I made my way to the local train station to catch the Shinkansen or bullet train to Osaka. Today, there's a spring in my step as I confidently navigated the train system. Even as I got squashed by the morning crowd rushing to get to work, I found myself even enjoying it, bizarrely. I reserved a seat on the earliest bullet train and just like a seasoned Japanese traveller, I availed myself a bento box and went down to my designated platform - without asking for direction. Yes, I was so confident in my ability to read Hiragana characters that I actually stood at the wrong platform and could have gotten into the wrong train going to the wrong place. Luckily, I quickly realised my mistake and moved promptly to the right area. 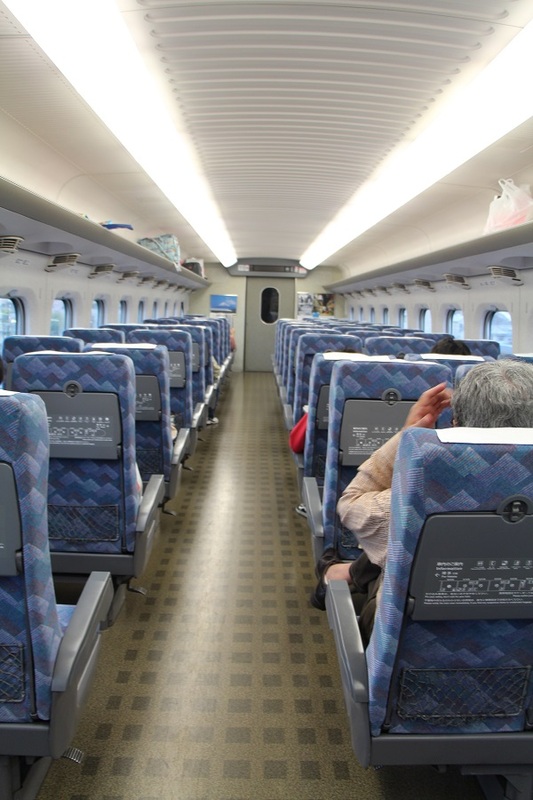 My Hikari train arrived and I dutifully settled in my seat for a 3-hour journey. I could hardly contain myself. My first bullet train ride! I didn't care how ridiculous I might have looked with a big silly grin in my face. Who cares, I thought to myself. I am about to take my first bullet train ride and that's the most exciting thing so far today! The elderly gentleman sitting next to me was rather nice and promptly nodded off to sleep as soon as we left the platform. I contemplated striking up a conversation with him, but after the mix up with the train platform earlier, I felt less confident and chickened out. I felt the train take off. This is it!!! Oh my, it's really fast, I thought to myself as I tried to keep my cool as much as possible. It was overcast outside but the speed of the train was more than enough to keep me enthralled as the landscape changed outside. I thought Yokohama and Nagoya were pretty forgettable, but then again I only saw a small part of these areas. Surely, there's more to these places than what you can see from your bullet train windows. Maybe. I arrived in Shin-Osaka in no time. I quickly made my way to to Osaka itself and down to Shin-Imamiya where I would be staying. Confident that I could find my way around, I just winged it and somehow made it to my small hotel. But that's after taking the wrong train and then taking the right train but making the wrong turn! Desperate times calls for desperate measures so I summoned all my remaining Japanese capabilities and successfully got the right direction from non-English speaking locals. My friend Tomoko did warn me that Osaka people don't speak that much English, which means lots of practice for me! Feeling a slight panic that I haven't really planned anything during my Osaka stay, I quickly plugged in and went online to find the best things to do when in Osaka. 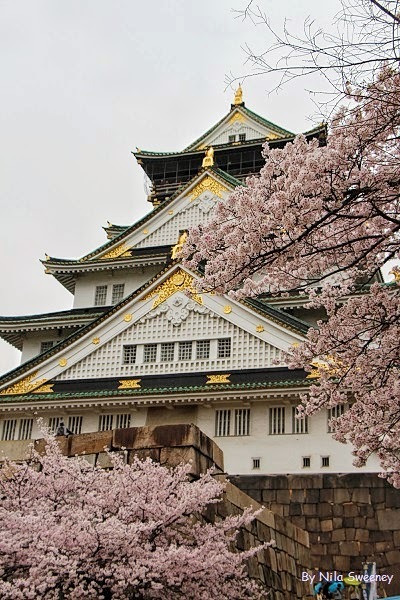 I've read a while back about Osaka Castle and decided that I will spend the rest of the day exploring the area. So off I went, camera on one shoulder, a stash of assorted papers and sweaters on the other bag. The Osaka Castle didn't disappoint. 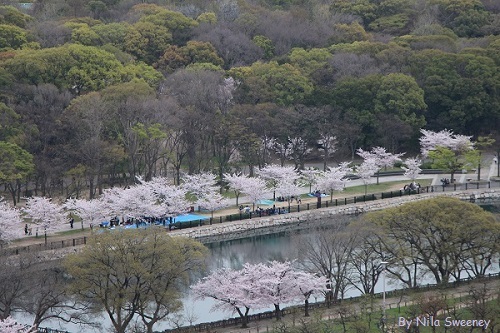 When I saw the sheer number of cherry trees in full bloom in one place, I nearly squealed. It was incredible! 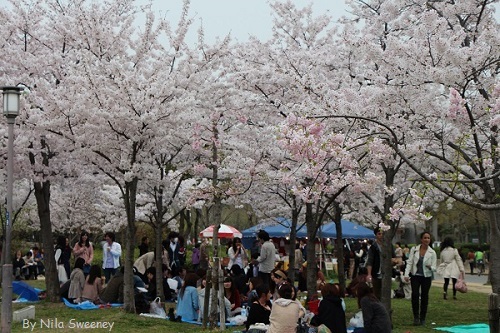 People were having picnics, getting married and generally having a great time even as it started to drizzle. To get to the Osaka Castle viewing deck, I needed to climb 8 steep and long flights of stairs. Dang, the steps were high and so steep. I was sweating like a pig when I got to the top. I took some more photos and then climbed back down. 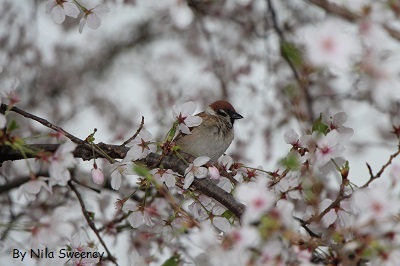 I couldn't wait to get back to those cherry blossoms! I wandered around the gardens and I lost myself completely. 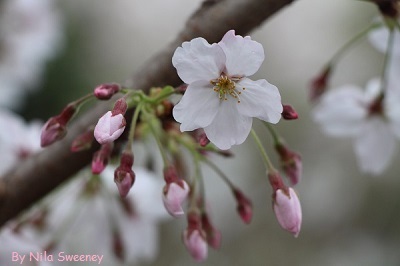 The hundreds and hundreds of cherry blossom trees clustered along the canal, around the garden area, everywhere I looked there were cherry blossoms of so many varieties! 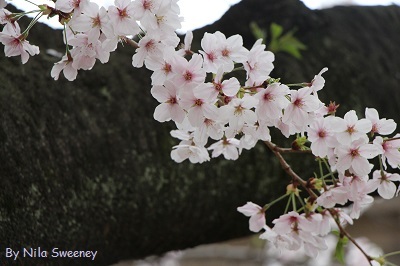 I couldn't keep up, there were so many cherry blossoms to see and photograph! There were no words. I was simply speechless. I felt so much gratitude to be alive to enjoy this marvellous display of beauty. I felt so incredibly privileged to be here, right at this moment. I said a quiet thank you to the universe for this wonderful moment. It was truly a paradise. Even though there were so many trees, their quiet elegance made it such a sensory delight. I strolled around the garden, admiring every single tree, not discriminating any. Everywhere I turned to; there was beauty at its purest. 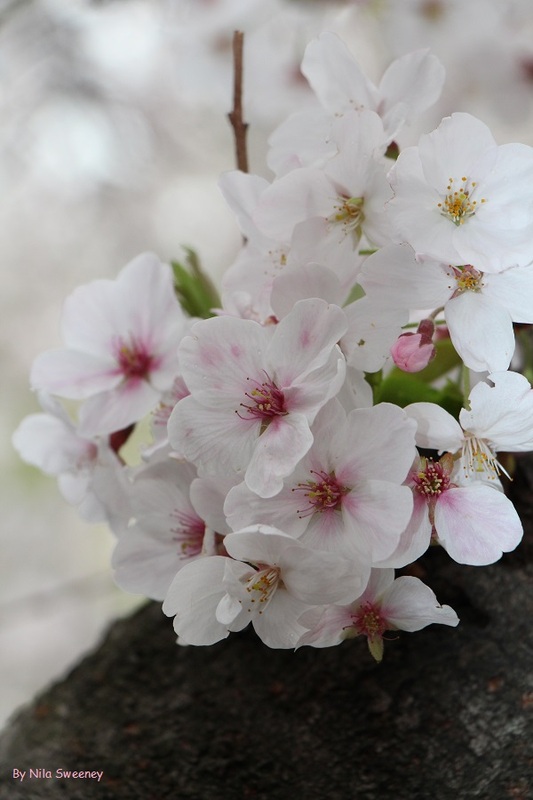 Small, dainty and incredibly beautiful, cherry blossoms are truly one of nature's masterpieces. I've walked and walked for more than 6 hours. I didn't want to leave the garden but the guards told me they're closing down some parts of the garden already. I thought about staying further but decided against it as darkness started to descend. With so much hesitation, I made my way to the train station to Osaka. I wanted to check out the famous Osaka City Station that I heard so much about. It was indeed a work of art. I walked another half hour before deciding my legs had enough walking. Time to retire these tired feet. I grabbed a nice bento box of cod and rice and headed back to my hotel. After dinner and a shower, I typed my handwritten notes about my Osaka adventure, knowing full well that words can never fully capture the spectacular beauty that I've witnessed today.